Do black ants kill termites ?Its true. 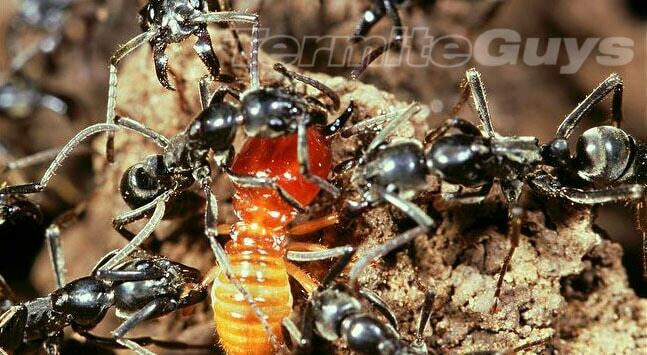 Black ants are natural predators of termites. Every chance they get, they’ll massacre termites for the easy protein. Termites are virtually defenseless in open confrontation even against some of the humbler species of ants. So whats the problem? Think about it for a second. If ants were the ultimate termite predator, why weren’t the termites wiped out millions of years ago? As time goes on, we slowly learn more about the interations between the two. Ants have many food sources and are scavengers, taking out targets of opportunity as they arise. The termites use thick mudding to conceal their activities, useful both as a humidifying agent as well as a barrier to predators. In your typical battle (when we consider conditions in Brisbane) the fight normally occurs when an accidental breach is made into a termite gallery by third party. This could be a deliberate act by a bird like a kookaburra or an accidental bump from a dog or human. Instantly detecting the termites’ odour, the ants rush forward. Alarmed, the termites beat a hasty retreat. A few will be surrended to the onslaught, satiating the aroused ants. Behind the lines, worker termites are sealing the breach with inpenatrable mud, thus saving the colony. The queen will lay extra eggs if the losses are severe but what are a few hundred in a hive of millions? Especially with the more nasty species like Schedorhinotermes or Coptotermes, numerical superiority lies with the termites. Coptotermes soldiers are also armed with chemical weapons, a special glue like exudate designed for enemies like ants. Schedorhinotermes have two distinct soldier castes, perhaps evening the battlefield. 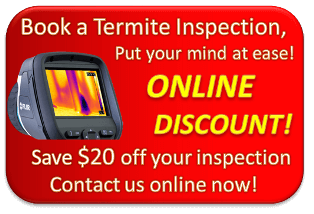 Recent research also indicate that termites can sense their environment by vibration signals. They may be well aware of the proximity of black ants by the frequencies generated by their busy activities! In this way they can avoid hotspots where ant locations are suspected. To be fair, even with the numbers against them, ants will make a meal of a nest if given the chance. To get through the many layers of termite defenses they’ll need a lot of help. If only we all had echidnas as pets….